First of all a big thank you to BIS for the Free DLC and the new TTs! Truly appreciated! I don't really like the music (it kinda fits though) but the design of the new TTs is awesome! I'm still working on So High and I just beat Gold. 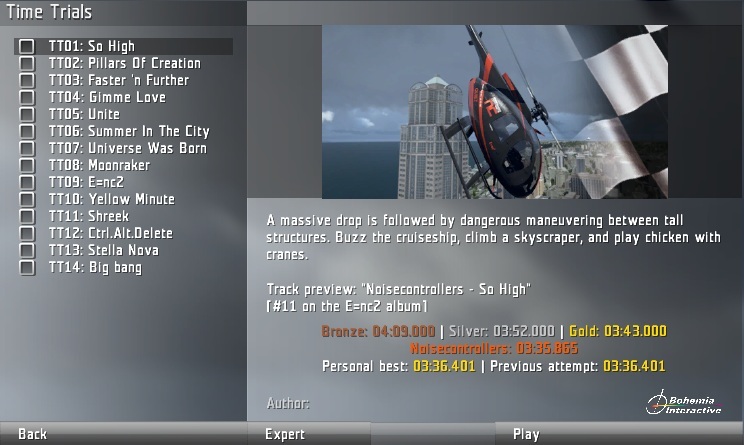 Expect a video once I beat NC time! Challenge accepted. TT11 Shreek noisecontrollers' time already smashed, my time is 4:03.488. I think noisecontrollers' time in that case is too conservative, as the first time trial is f... hard ;). Enjoy new DLC and music is great. Pretty stressed at the moment, but I just got a new GPU and I'm almost there! My computer tried to tell me the NoiseControllers file was malicious. I told my computer I was willing to take that risk. So how do you dance with the skyscraper? I tried many different approaches (including quite a lot screwups and a few crashes :D) and stuck with the one you see in my video because you keep a lot of speed if done right. I try it every once in a while, but after absend for some weeks I have to relearn my reactions/input/adjustments again.